Dr. Steven Kerns graduated from the University of Nebraska Medical Center College of Dentistry in Lincoln in 1985 before opening Lincoln Family Dental. Prior to dental school, he earned a Bachelor of Fine Arts in education. Dr. Kerns regularly continues his education each year so he can continue to provide exceptional, high-quality dental care. 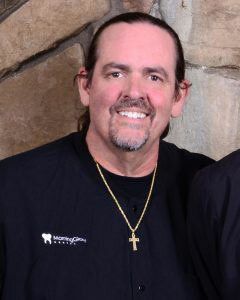 He has received advanced training in implant dentistry and is a Premier Provider for Invisalign®. When Dr. Kerns has a moment to spare, he enjoys drawing, painting, reading, watching movies, and playing the bass guitar at his church. He is the father of six children and grandfather of nine.